Our Wedding Combo D.I.Y. 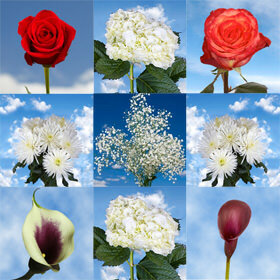 Sweet Love is a magnificent selection of 392 flowers. This dreamy combo contains; 120 stems of Mini Calla Lilies 2 choice of colors, 100 stems of Roses your choice of colors, 40 stems of White Hydrangeas, 72 stems of White Daisy Poms and 60 stems of Baby's Breath. Vases are not included. 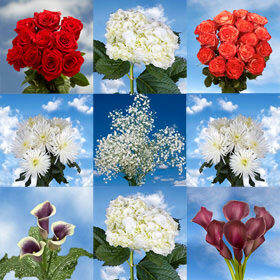 Choose the color of your Mini Calla Lilies (1 choice of color). You have a total of 1 colors (10 stems per bunch) to choose. We have carefully grown our flowers for your White Theme Wedding Flowers Lilies Hydrangeas Roses Daisies We are passionate about the quality of all of our flowers. When you buy our White Theme Wedding Flowers Lilies Hydrangeas Roses Daisies you are guaranteed to receive a freshly cut bunch of flowers. Our White Theme Wedding Flowers Lilies Hydrangeas Roses Daisies are perfect to take your occasion to the next level. Though many online florists will tell you they have the best flowers for your Wedding Combo D.I.Y. Sweet Love we can guarantee the freshness of our flowers. We never sacrifice quality when it comes to any of our floral products. Our greenhouses are eco-friendly, and we can guarantee the freshness of all of our flowers. We carefully monitor the growth and development of all of our flowers. 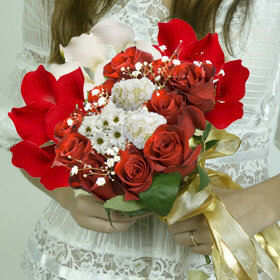 You'll be glad you chose to order your White Theme Wedding Flowers Lilies Hydrangeas Roses Daisies with us.